Before we get to the meat of the post, let's first address the photo above. One of my dearest pals, Tom Nugent happens to take some damned fine photos of people doing their rock 'n roll thing. This one here is a favourite of mine. Take a good look at that animal and you can get an appreciation for what's going on at that show. It's this one perfect moment of a man giving his all to a crowd, under a spotlight and microscope. The photo was taken at a recent show in Vancouver at The Commodore while J. Tillman now tours as Father John Misty. Say thanks to Tom for that little moment. Thanks, Tom. There's a music blog I frequent for new and old folk gems, maybe you go there too. It's called Slowcoustic and has archives back to 2008, so if you're looking for music from the, "Unhurried side of Americana/Alt-Country/Folk/Indie/Down-Tempo music", this is the place to go, and you have a lot of digging to do. For all you J. Tillman fans, or all fans of folk in general, Slowcoustic has done you a favour and helped produce a J. Tillman collection of songs alongside some real fine musicians. The stack of songs is titled, Long May You Run, J. Tillman Revisited. 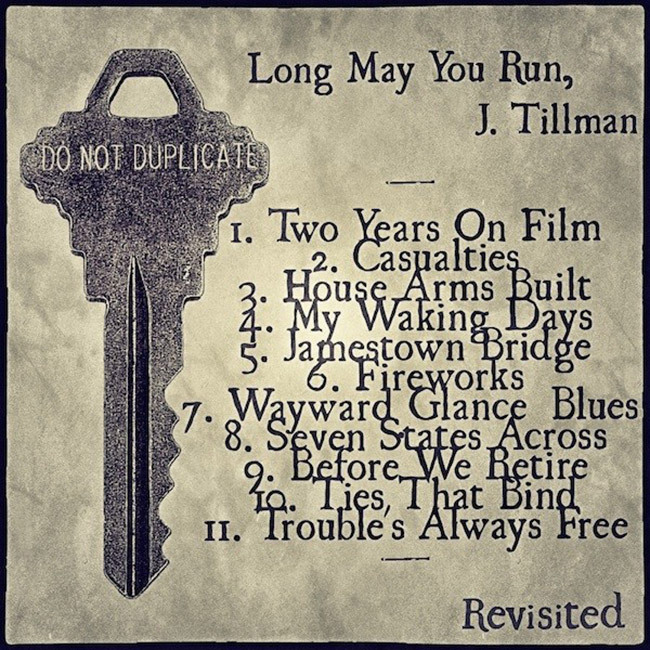 The album also pulls its look from Tillman's own Long May You Run, a matchbook styled cover, limited run album from 2006. Here's a photo of Slowcoustic's numbered copy of the KEEP Records' original release, and the artwork for the cover album. You're wondering where you can go steal yourself a copy of this baby? Don't even worry, pirate. It's already free and available in its entirety on Soundcloud. Not just that streaming noise either, you can download each track and hit the road with them. Below I grabbed a quote from Slowcoustic about the project and a few samples, including one from Doc Feldman, who I learned about in a post on Slowcoustic last in November. I've previously put up the two Show me Shows by Doc Feldman. If you haven't seen it them, get on it.